DALLAS, TX--(Marketwired - Jul 13, 2016) - New consumer research from Parks Associates finds a continued decline in the adoption rate for desktop computers. 360 View: CE Adoption & Trends reveals that since 2009, nearly one-third of U.S. broadband households have abandoned desktops as a platform. Only 6% of U.S. broadband households rely exclusively on desktops, while an additional 6% of households use only a combination of desktops and tablets. "Desktop adoption has declined from a peak of 91% down to 61% of broadband households, and it will not recover, as just 12% of households bought a desktop in 2015. 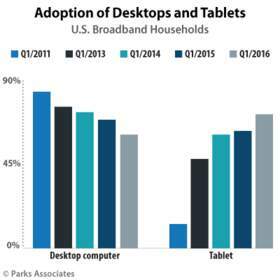 In its place, tablet adoption has moved upwards, reaching 72% at the start of 2016," said Barbara Kraus, Director of Research, Parks Associates. "The adoption rate of tablets surpassed desktops in 2015. Moreover, the gap between laptop and tablet adoption is narrowing." Nearly one-half of broadband households now own a smart TV, with one-third now owning a streaming media player. The adoption rate for Internet-connected audio systems remains low. More than one-third of broadband households connect a computer to a TV set. The adoption rate for Blu-ray players has stagnated. "Consumers generally begin the CE purchase process with preconceived notions about a brand, and these have an enormous impact on the final purchase decision," Kraus said. "Associating a brand with a product category may therefore be more important than associating it with specific products. CE manufacturers should keep this in mind as they design their marketing strategies and ensure that their messaging creates the desired reputation for their brands among consumers." More information about this 360 View is available at www.parksassociates.com. To schedule an interview with an analyst or to request specific data, contact Holly Sprague at hsprague@gmail.com, 720.987.6614.